While open educational resources (OER) are making headway in higher education classrooms, it's slow going. That's what a recent survey by the Babson Survey Research Group found when it queried 2,711 teaching faculty members within U.S. colleges and universities. On the positive side, awareness and adoption have grown from previous years. Use of open-licensed textbooks has risen from 5 percent in 2015-2016 to 9 percent the following year. Also, awareness of OER is up by a third in 2016-2017 compared to 2014-2015. In the latest year of the survey, 30 percent of respondents said they were "aware" or "very aware" of OER; two years prior only 20 percent said the same. Among faculty members who expressed awareness of OER, a rising number also reported awareness of Creative Commons, a licensing approach for designating curriculum in the public domain; while 22 percent said they were aware or very aware in 2015-2016, that had increased to 25 percent in the subsequent year. 28 percent noted that OER was "not high quality" (the same share as the previous year). Source: "Opening the Textbook: Educational Resources in U.S. Higher Education, 2017," from Babson Survey Research Group. Where OER particularly succeeds, the survey found, is in large-enrollment introductory-level courses, those taken by the largest numbers of students, taught in multiple segments and typically part of requirements. Faculty who specifically teach those courses were presented with a list of the commonly used textbooks (both from traditional publishers and Rice University's OpenStax non-profit). Researchers found that the rate of adoption for OpenStax is at 16.5 percent, "a rate which rivals that of most commercial textbooks." It's also a "substantial increase" from the previous year, when OpenStax adoption stood at 10.8 percent. Users of OpenStax materials also had levels of satisfaction equal to their peers teaching introductory level courses who had selected commercial textbooks. The standout exception related to cost, where OpenStax users were "far more satisfied." Faculty who hadn't chosen an OpenStax textbook reported an average cost of $125 for the required textbook; those who did select an OpenStax text reported an average cost of $31. According to the report, OpenStax has succeeded especially well because it follows an "adoption and distribution model" like the one used by commercial publishers, which includes print versions that can be made available for a small charge in campus bookstores. As the researchers explained, "Faculty have a well proven model for selecting their teaching materials, and any new player will have to be successful within that model." 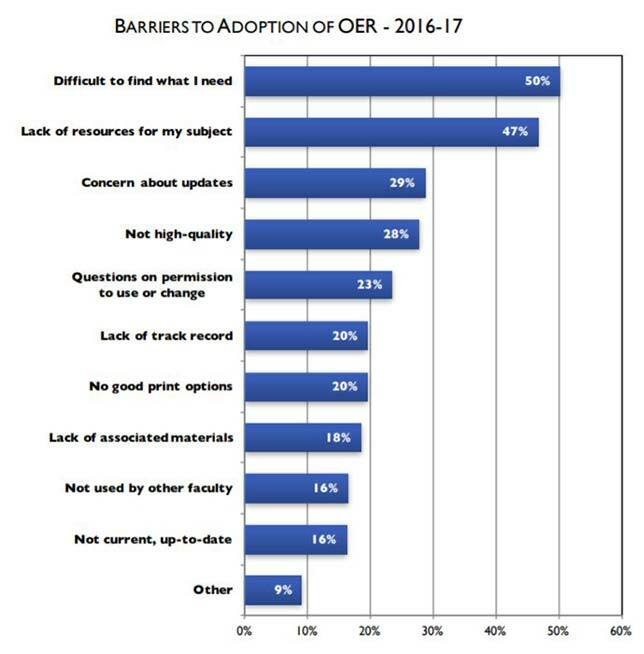 While the number of faculty members who said they expected to adopt OER in the next three years stayed the same from 2015-2016 to 2016-2017, the number claiming they would consider OER rose from 31 percent to 37 percent. Overall, the report concluded, "OER remains a minority (or even niche) product among higher education teaching faculty." However, the latest numbers suggested "continued but moderate growth." The complete report is openly available on the Babson Survey Research Group website.